At Badgerbrook, P.E. and sport are seen as playing a vitally important role in pupils’ development as rounded and physically active young people. In recent years the Governing Body has allocated a substantial amount of money towards teaching expertise and resources. Mr Williams has been the specialist P.E. teacher for the last twelve years. Badgerbrook has a very good reputation locally for achievements in P.E. and sport – and a very full trophy cabinet! P.E. is taught to all children, from Foundation Stage to Year 6, enabling them to develop good basic skills at a young age, which they build upon as they progress up the school, through a carefully structured and challenging programme. We seek to provide positive experiences, which will develop an enthusiasm in the children which will see them inspired and involved in sport for many years to come. At Badgerbrook, we offer a wide variety of individual and team activities: traditional and sportshall athletics, basketball, benchball, cricket, cross country, cycling, dance, football, golf, gymnastics, hockey, netball, orienteering, rounders, rugby, swimming, table tennis and tennis. The school has looked to extend the opportunities for less confident pupils to play competitive sport. Badgerbrook children participated in benchball, boccia, kurling, multi skills and sportshall athletics competitions. This will continue in future years. Also, during the PGL residential week, the children in Year 6 experience the chance to enjoy different sporting activities: abseiling, aeroball, archery, climbing, fencing, high ropes, kayaking, quad bikes, shooting, team building challenges, zip wire. Every year, Badgerbrook challenges for honours in athletics, basketball, boys’ and girls’ cricket, cross country, boys’ and girls’ football, hockey, netball, rounders, swimming, tag rugby, table tennis and tennis. The school is proud of these achievements. Provision of sport outside school hours has two main objectives. One is to provide as many opportunities for as many children as possible to enjoy the thrill and excitement of competition and representing their school with pride; which we fulfil by entering a number of teams when competition rules allow us to do so. The other is meeting the challenge of providing the children who have been identified as ‘gifted and talented’ with opportunities to extend themselves in competition against similar children from other schools. Providing sufficient opportunities for competitive sport to meet the depth of enthusiasm from the children presents its own challenges. Within primary school sport locally, only cross country (years 3-6) and football (years 4-6) have a season of any real length, both running for almost two terms. As a result, in both of these sports, everyone who would like to run or play can be given the opportunity to do so. In all other sports, the season is either very short (the cricket season is the next longest at 4-5 weeks) or the competitions are mostly held as a single tournament. Badgerbrook enters as many teams as we are eligible to, or are able to provide staffing for, to maximise the opportunities for the children. As well as participating in sport, the older children also take on the role of sports leaders in our vibrant playground. We have invested in playground equipment to make our playtimes as enjoyable and stimulating as possible. Our Midday Manager has taken on the role of training our sports leaders to co-ordinate playground activities. We have also established links with local sports clubs for the benefit of our children. These links have allowed us to use the facilities of these clubs when sometimes a school setting has not been sufficient, have resulted in club coaches working alongside Mr Williams at school training sessions and also provided pathways for children to join clubs outside school to further their enjoyment and participation. We currently have links with Saffron Athletics Club, Narborough & Littlethorpe Cricket Club, Blaby & Whetstone Boys Football Club, Cosby Girls Football Club and Vipers Rugby Club. Badgerbrook Primary School’s reputation for sporting excellence has resulted in visits from a range of sporting VIPs. Following one of our many tag rugby successes, Leicester Tigers, England and British Lions, Harry Ellis and Tim Stimpson came to deliver a masterclass to Year 5 classes in front of the Sky Sports cameras, which was televised on ‘The Rugby Club’. In the run up to London 2012, world junior triple jump silver medallist, Laura Samuels gave a presentation to the whole school about her career, combined with a triple jump demonstration and a question and answer session. After London 2012, we received a visit from six time paralympian, Jane Stidever, and her mother Jill, who coached the swimming team at several paralympic games. Jane had won sixteen Olympic medals, five of them gold, and achieved the remarkable feat of winning gold in both swimming and equestrian at the same games. Jane and Jill reminisced about their experiences and gave the children an opportunity to examine some of Jane’s medals. Multi British pole vault champion, Kate Dennison, also came to visit, to share her experiences of Beijing 2008 and London 2012, and lead a training session with our athletics team. 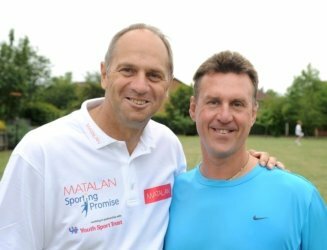 Our proudest day was undoubtedly the visit of Britain’s greatest Olympian, Sir Steve Redgrave. Sir Steve was travelling the country on behalf of Matalan, promoting the new TOPS games programme, which is designed to help primary school teachers deliver the P.E. curriculum more effectively. Badgerbrook was privileged to be chosen for his visit after Mr Williams had trained teachers from over 50 schools in Leicestershire in how to use the TOPS initiative. After showing inspirational videos of Sir Steve’s Olympic performances, he spoke at length to our pupils about his career, before joining in with our Year 6 children in a TOPS games session, led by Mr Williams, in front of various local press agencies and the East Midlands Today cameras. Sir Steve then stayed on afterwards for a significant time to sign autographs and for photographs with children and families. What a truly memorable day and what a truly great man! Furthermore, on a very special day in May 2013, our Year 3 tag rugby team were invited by Leicester Tigers to represent them in a tag rugby demonstration match at Twickenham, during the half time break in the Aviva Premiership Final between the Tigers and Northampton Saints. What an experience, playing in front of 80,000 people!